A computerised GO-TO controller system which can be added to the GP2 and GPD2 mounts. The two sets of 5 control buttons enable simple menu navigation as well as push button control of the mount. 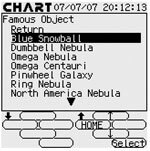 As you move through the Star Book menus, the function of each button is shown on the display. 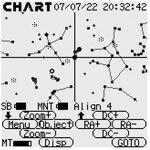 In Scope Mode, where telescope motion is controlled in real-time, manual motor corrections and slewing are scaled to the zoom setting of the star chart. Motion is fast when the chart displays wide fields and becomes progressively slower when zoomed to narrower fields. Firmware updates are downloadable to Star Book using a crossover LAN cable for direct PC connection or a conventional LAN cable via a network switch or router. (Note: Cables not supplied with Star Book). The IP address of the controller must be manually set on the PC when using a crossover cable. The Star Book can request an IP address from DHCP when used on a network. GO-TO and other operations are confirmed by audible tones. The Star Book has menus in English, German, French, Italian, Spanish and Japanese. 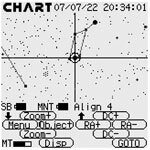 Compatible with celestial navigation software commercially available on the market, including Stellar Navigator and Stellar Gear. There is also support for the ASCOM platform via third party drivers. This allows applications such as Cartes du Ciel to interact with Star Book. Please check third party software supplier websites to confirm the latest compatibility information. 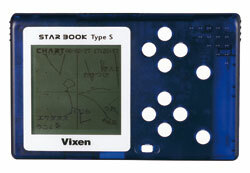 A 12V DC power supply can be attached to the Star Book directly without attaching it to a mount. This allows the Star Book to work as a stand-alone ‘night sky’ simulator for observation planning. Automatic guiding is possible by connecting a guide scope, CCD camera, and autoguider. For information on autoguiding features and functions, please contact third party suppliers of ST-4 compatible autoguiding products. It is possible to move the mount in vertical or horizontal directions, as on an altazimuth mount, with a single key press. Orbit data for comets can be downloaded to the controller, allowing automatic location and tracking. Star Book has a periodic error correction (PEC) function to allow the user to ‘train’ the controller to compensate for small errors in mount motor movement. Note that the PEC data is not stored when the controller is switched off. PEC training takes only a few minutes and is essential for accurate tracking during long exposure astrophotography. The GO-TO accuracy of the Star Book can be fine-tuned by aligning to multiple stars. Once alignment is done and an observing or photography session is complete, the scope can be returned to a “home” position. This allows a quick start up next time. 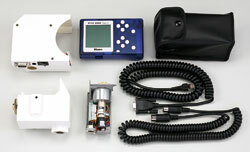 Consists of Star Book S hand controller, two motors, RA motor housing with circuit board, cables and a battery box. An optional mains adapter and powertank cables are available.